Newly built St. Peter’s Church was dedicated in 1846. In 1860, the church membership begin building a new church to be known as St. Paul’s. Parishioners have been ministering to the membership and the community at large for 170 years. Demographics and social economics have changed St. Paul’s membership, attendance and income. 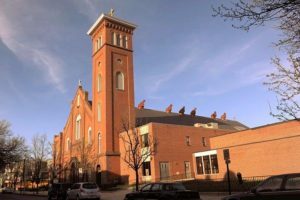 Today, St. Paul’s is still a vibrant community of faith with three primary languages spoken among its members; English, Spanish, and Vietnamese. St. Paul’s is a beautiful church with a rich history but income lags. Due to the changing community, it is difficult for the current membership to pay for an old church in need of much upkeep and repair. Kirby-Smith Associates was chosen to help raise funds for critical repairs to keep the doors open. Kirby-Smith conducted a Capital Campaign, One Family (in three languages), which exceeded goal. The future is still uncertain at St. Paul’s, but needed repairs were made and a new chapter in the life of St. Paul’s parishioners has begun as the church continues to flourish and minister to those in need.